mcpipes was very quick to get to the drawing board in developing a proper free flowing downpipes for the BMW N55 motor used across so many platforms. The BMW F87 M2 is a platform that we are so heavily focused on due to the pure balance that it has. Small chassis that is very agile on track, yet carries a heavy torquey punch. Many of our clients always inquire about a quality downpipe that will be resilient to long term track use, perfect fitment, and high performance. In-house, mcpipes digitally scans the vehicle application and utilizes that data as a baseline to develop their free flowing product. All of the flanges and fittings are CNC. Everything is TIG-welded with high end stainless steel. After prototyping is completed, test products are then installed to assure fitment. Proceeding successful test fitting, power/torque measurements are made on the dyno to assure beneficial performance. Like many of the products that we sell and install, we always do our best to do our own independent testing to inspire confidence in what our manufacturers offer. On the dyno, at max values, we gained 14whp and 23wtq. At 3000RPM, +20whp +35wtq. At 4500RPM, +32whp +28wtq. At 6500RPM, +10whp +9wtq. 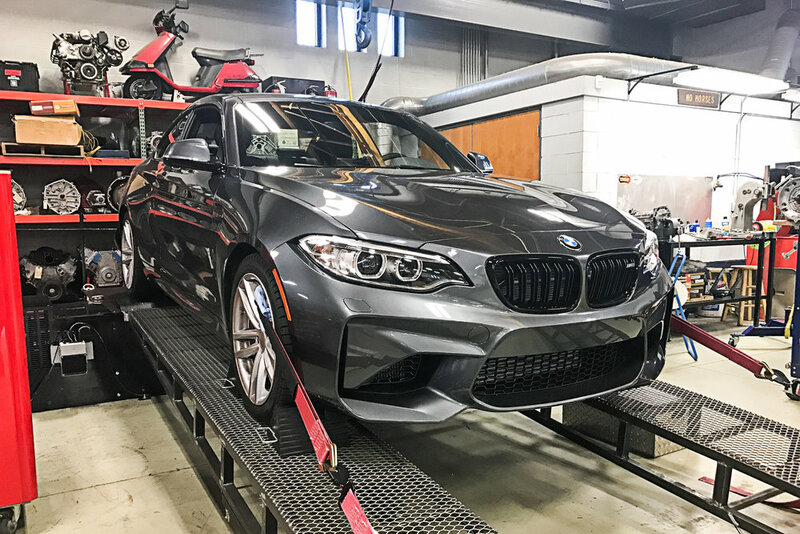 All measurements were conducted on an otherwise 100% stock BMW M2. Massive gains throughout the power band! In addition to the big power gain, weight reduction is always another goal strived for. Stock downpipe weighed in at 3.4kg (7.5lbs). mcpipes dpwnpipe with 200cpsi cat is 3.05kg (6.7lbs). mcpipes catless downpipe weighed 1.95kg (4.29lbs). For a street and track proven downpipe, the mcpipes downpipe has truly been at the top of our choices. We do our best to have these available for immediate shipping and delivery. In addition to the hardware, we also have a software ECU tune from mcchip-DKR available.